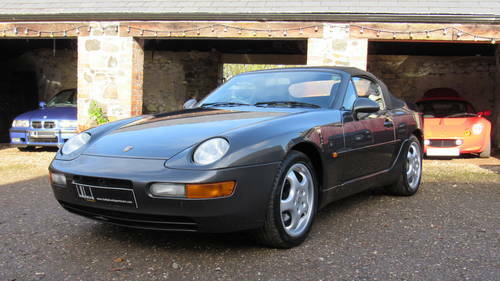 The Porsche 968 was seen to be the model which helped keep Porsche afloat during the difficulties experienced in the early 90’s,being a successful evolution of the longstanding Porsche 944. A new 968 Cabriolet was said to be an approx £38k, but this didn’t seem to deter interested parties from enjoying their drives in the sun. 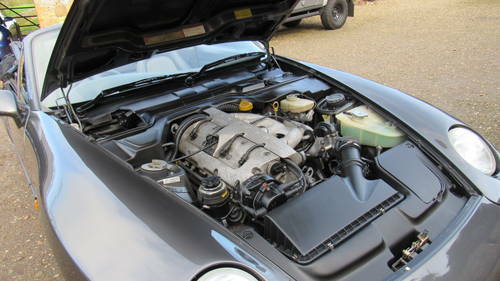 The fabric hood may have interrupted its now iconic design, but its showpiece was the marvellous 3.0 four cylinder 24v engine seen across the range. 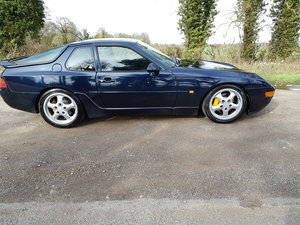 Producing a healthy 240 Bhp, it was an engaging drive which helped to create one of the most enjoyable Porsches within their stable. 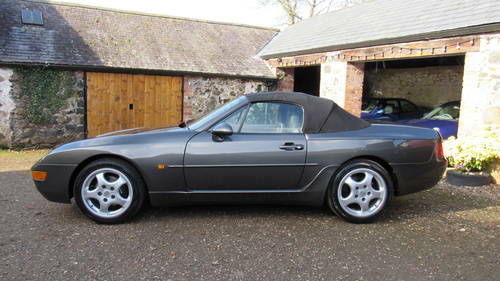 Finished in dark grey metallic, this car looks spectacular and one of the best colour choices for the Porsche 968 model. It is clear that this car has been cherished, and on closer inspection the paintwork is in very good condition with a few minor age related marks for its age and mileage. Overall, a good clean example. 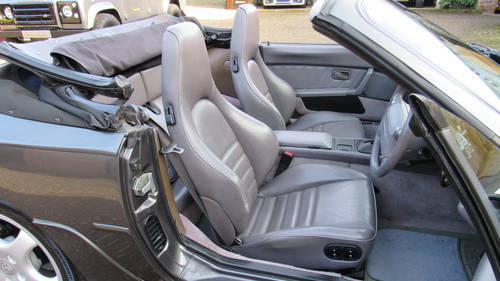 Within this car’s cabin, you will be delighted to find the up-graded sports seats, which is quite a rare factory option, especially for a cabriolet. The leather interior is finished in grey marble, with light grey carpets and interior trim throughout. The leather seats have worn remarkably well, with the bolsters still good and firm and showing little wear for its age and mileage. 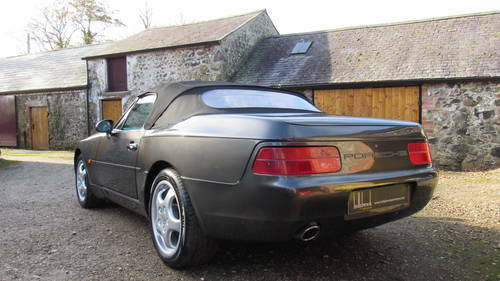 This 968 cabriolet has been supplied with the iconic cup alloys, with this particular example having the wheels recently refurbished in their original silver colour with four new tyres recently fitted. This particular Porsche comes with its complete leather dealer pack, its service booklet, both keys and numerous pamphlets & leaflets whenever it was sold new. 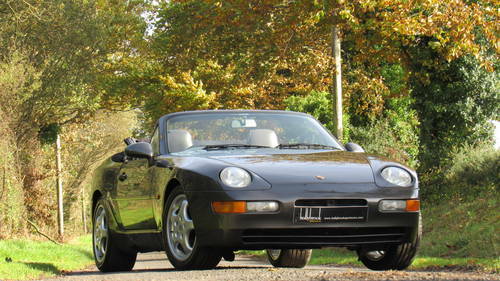 It was supplied through Porsche Reading on the 11th of February 1994, and also comes with a history folder. Within its paperwork, the service booklet boasts 19 service entries and has recently had a major service completed. The history folder shows a number of previous mots, service invoices and a variety of receipts highlighting how this car has been looked after throughout ownership. Shared road tax system with DVLA Swansea.